A light bulb is a device that produces light from electricity. In addition to lighting a dark space, they can be used to show an electronic device is on, to direct traffic, for heat, and many other purposes. Billions are in use, some even in outer space. Early people used candles and oil lamps for light. Crude incandescent lights were made in the early and middle 19th century but had little use. Improved vacuum pumps and better materials made them shine longer and brighter late in the century. Electric power stations brought electricity to urban and later rural areas to power them. Later gas discharge lights, including fluorescent lights, use less electricity to make more light. Light bulbs convert electricity into light and heat. Except for heat lamps, the heat is considered waste. A light bulb that produces more light and less heat is more efficient. The incandescent light bulb turns electricity into light by sending the electric current through a thin wire called a filament. Electrical filaments are made up mostly of tungsten metal. The resistance of the filament heats the bulb up. Eventually the filament gets so hot that it glows, producing light. Fluorescent lamps are efficient, and only give off ¼ the amount of heat of an incandescent. They also last longer than incandescent but until the late 20th century were much bigger and did not fit into sockets for small overhead lights and lamps like an incandescent could. A fluorescent bulb is a glass tube usually filled with argon gas and a little bit of mercury. When turned on, the cathode heats up and sends out electrons. These hit the argon gas and the mercury. The argon gas makes a plasma which lets the electrons move around better. When the electrons hit a mercury atom it puts the molecule into a state where it has a lot of energy (stores the energy). The energetic state doesn't last very long, and when the energy is released, it lets out a photon. Photons from mercury are not visible like some other photons; they are ultraviolet. So there's a phosphor coating on the wall of the bulb. When the photon hits a phosphor molecule, it in turn puts that molecule into an excited state. When this phosphor releases energy, it lets out a photon that we can see, and light is made. Changing the type of phosphor can change the color we see, but usually fluorescent light bulbs are whiter than incandescent light bulbs, which are slightly yellow. An LED is made like electronics. It's a chip of semiconducting material. LED bulbs are more efficient and last much longer than either incandescent or fluorescent bulbs. Unlike fluorescent bulbs, LEDs do not use mercury, which is toxic. For several years LED bulbs were not as bright as the other kinds of lights, and cost more too. Most light bulbs fit into a socket which provide a high voltage level of electricity. If the socket is turned on, even if the bulb is out, there is a real danger of an electric shock. Incandescent bulbs get very hot when they are turned on, and take some time to cool off. Touching the bulb when it is hot can cause burns. Most light bulbs are made of glass, which means that they can break easily. The broken glass has sharp edges which can cut through skin. If a fluorescent bulb breaks, the mercury inside will give off vapor which can cause mercury poisoning if breathed in. ↑ "How Does a Lightbulb Work?". June 17, 1992. Retrieved 20 May 2012. ↑ "Edison's Inventions". about.com. Retrieved 21 March 2013. ↑ Ozzie Zehner (2012). "Promises and Limitations of Light Emitting Diodes". Retrieved 20 May 2012.
science theater (June 17, 1992). "How does a lightbulb work?". Retrieved 20 May 2012. 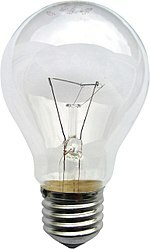 Wikimedia Commons has media related to Light bulbs.